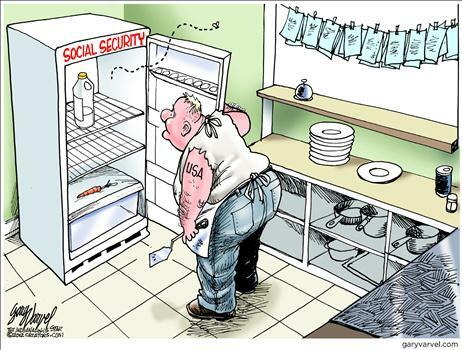 Since we recently learned Social Security is even more financially decrepit than previously estimated, let’s cheer ourselves up with a couple of cartoons. This first one is a pretty good assessment of what’s going to happen in a few years if we don’t see reform. Think about what’s happening in Europe, if you don’t have a good imagination. This cartoon covers the same topic, but looks at how an aging population is going to create unsustainable fiscal demands. There are solutions, of course, but don’t hold your breath waiting for them to be implemented. Incidentally, you may recognize the artistic style in the second cartoon. It’s by Ramirez. 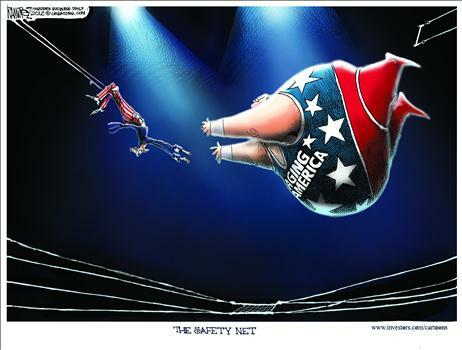 Here are links to some of his other cartoons that I found especially worthwhile: Here, here, here, here, here, here, here, here, and here. I did some rough math on this once. If a worker, starting in 1960, put $100 per month in Treasuries (what his money would earn in the “Social Security Lockbox”) he would be retire in 2010 with about $500,000 in his retirement account. On the other hand, if that same money went into the DJIA, he would retire with a nice nest egg of about $1,500,000. In other words, we are stealing ONE MILLION DOLLARS from this worker’s retirement account by forcing him to put his money in Social Security. The federal government doesn’t “save” for our retirement. It takes from you during your working years and gives the money to retirees on the promise that when you’re retired, it will do the same on your behalf. How did we ever allow giving the Federal Government the authority to save for our retirements? There should have been a revolution during the New Deal/FDR years. This is crazy. The only person I trust to save for my retirement is me.